The Flemish Apocalypse is the first extant illustrated Apocalypse originating from the Low Countries and dates to around 1400 CE. In contrast to earlier illustrated Apocalypses such as the Trinity Apocalypse or the Bamberg Apocalypse, which sometimes devoted more than eighty images to visualising the text of Revelation, The Flemish Apocalypse uses only twenty-two images. This results in a more compressed, economical imagining of the vision, in which each image combines several elements of the narrative. In this case, all the elements of the New Jerusalem vision from Revelation 21—the descent of the city, the measuring of the city, and so on—are presented in a single image, while The River of Life from Revelation 22 is not depicted at all. Although the disproportionately large Lamb representing Christ is situated in the middle of the city, God remains in the heavenly realm above, indicating resistance on the part of the artists or theological advisors to depict God amongst mankind. Similar reservations are reflected in the Angers Apocalypse Tapestry and in the Trinity Apocalypse. The city itself takes the form of a castle, with twelve gates guarded by the twelve angels decreed in Revelation 21:12. 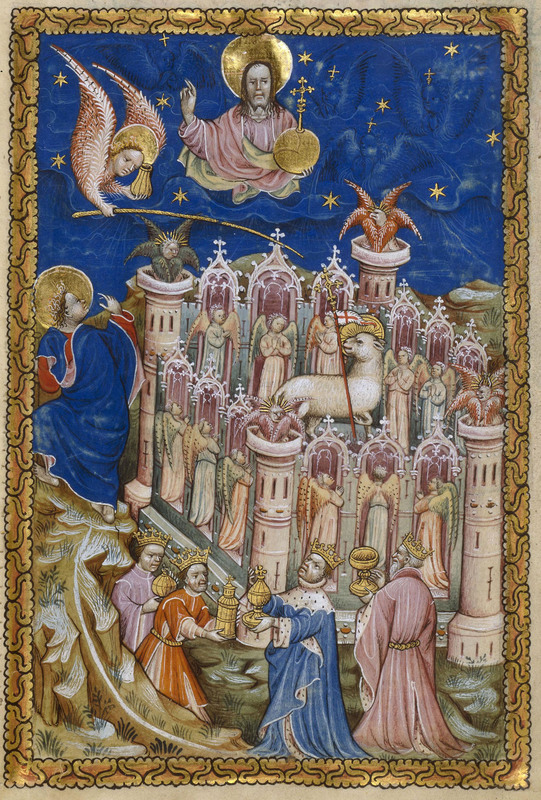 While clearly not based on the actual city of Jerusalem, the Flemish Apocalypse's visualisation of the celestial Jerusalem has a realism lacking in earlier representations. The Flemish artists have also made an attempt to people the city (contrast the Bamberg Apocalypse), with kings offering each other gifts. This also gives the Flemish New Jerusalem a more celebratory air, compared to previous renditions.